Today I am having lunch with Aly and Jeff. I posted their pictures a couple of days ago, from when they were in their 20’s (or 30, tops). I should mention that today, Jeff is the editor of Parabola Magazine and Aly has a book contract, and I forget the publisher. We’re all writers! 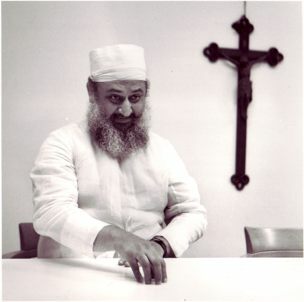 Many many many years ago, when I was a photographer, I took a picture of the head of the Zoroastrians for Parabola Magazine. I was very proud. Ohmygod. The cross! I’m pretty sure I cropped that out in what I gave them. I think. My then soon to be sister-in-law Carol Zaleski, who was a student in the Department of Comparative Religion at Harvard, was interviewing him. Zoroastrianism is generally considered the oldest organized religion. The last I heard, anyway. It’s from Persia (Iran) and it was the first religion to lay out the battle between good and evil, although maybe I am remembering that from the Nietzsche book, “Thus Spake Zarathustra,” which I read in college because it made me feel like a smart person (Zarathustra is the name Zoroaster in another language).